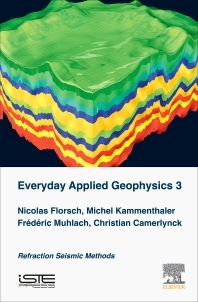 Everyday Applied Geophysics 3: Refraction Seismic Methods covers the physical methods that permit the environmental exploration of the sub-surface in 1, 2, 3 or 4 dimensions (the latter for time-lapse in terms of physical environmental state and geometry). The book specifically addresses the methods feasible, accessible and affordable to all users and provides simple apparatus electronic diagrams, along with Internet open-source and free software links for data interpretation. Nicolas Florsch is an Engineer Geophysicist (EOST), Professor at Sorbonne University, he teaches Applied Geophysics in the academic setting. After a thesis in electrical prospecting, his research leads him to take an interest in seismology, to variations of gravity (terrestrial tides), then to reinvest the subsurface investigation methods, or "applied geophysics", which it applies to resources and the environment, as well as archeology. Former consultant of Scientific and University Cooperation at the Embassy of France in the United States, he is the author of more than 120 scientific publications. Nicolas Florsch also holds a license of amateur radio (F4HOS), and practices several instruments in traditional Appalachian music. Michel Kammenthaler is professor of technology in the Val d'Argent in Haut Rhin, France. Among its activities, 3D design and prototyping. Graduate of the University of Technology in the field of electronics and computing, Frédéric Muhlach then specialized in the field of digital imaging and obtained a Diploma of Engineer Technologist (title level II which has been replaced by a professional license "digital trades"). These two diplomas were obtained at the University of Lorraine in Saint-Dié-des-Vosges. After his studies, he was a 3D graphic designer (animation and 3D modeling) as an intermittent show to create computer-generated images of a film "Histoire de Pierres". Following this professional experience, he was led to give some courses to students under license (still in St-Die) in the field of 3D computer graphics. He then became a Contract Officer specialized in the field of human resources in the Army on behalf of the 152nd Colmar Infantry Regiment. His 6-year contract ended, I pursued a career in IT by becoming a "programmer" on behalf of theDirectorate General of Public Finance at the Directorate of IT Services in Strasbourg. His job was to qualify professional applications as well as high availability technical architectures. Passionate about new digital technologies and digital creativity, he is currently in charge of a Fablab, the Labs of Val d'Argent.